An ice shelf is a thick slab of ice, attached to a coastline and extending out over the ocean as a seaward extension of the grounded ice sheet. 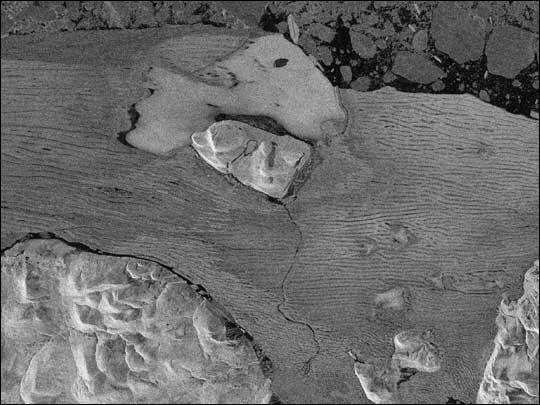 Ice shelves range in thickness from about 50 to 600 meters, and some shelves persist for thousands of years. They fringe the continent of Antarctica, and occupy a few fjords and bays along the Greenland and Ellesmere Island coasts. (An ice shelf occupying a fjord is sometimes called an ice tongue.) At their seaward edge, ice shelves periodically calve icebergs, some the size of a small U.S. state or European country. Because they are exposed to both warming air above and warming ocean below, ice shelves and ice tongues respond more quickly than ice sheets or glaciers to rising temperatures. Most ice shelves are fed by inland glaciers. Together, an ice shelf and the glaciers feeding it can form a stable system, with the forces of outflow and back pressure balanced. Warmer temperatures can destabilize this system by increasing glacier flow speed and—more dramatically—by disintegrating the ice shelf. Without a shelf to slow its speed, the glacier accelerates. After the 2002 Larsen B Ice Shelf disintegration, nearby glaciers in the Antarctic Peninsula accelerated up to eight times their original speed over the next 18 months. Similar losses of ice tongues in Greenland have caused speed-ups of two to three times the flow rate in just one year. While calving or disintegrating ice shelves don't raise ocean level, the resulting glacier acceleration does, and this poses a potential threat to coastal communities around the globe. Worldwide, more than 100 million people currently live within 1 meter of mean sea level. Greenland contains enough ice to raise sea level by 7 meters, and Antarctica holds enough ice to raise sea level by 57 meters. While these ice sheets are unlikely to disappear anytime soon, even partial loss of the grounded ice could present a significant problem. In the coming decades of a climate warming era, ice shelves and ice tongues are likely to play a prominent role in changing the rate of ice flow off the major ice sheets. Ice shelves fall into three categories: (1) ice shelves fed by glaciers, (2) ice shelves created by sea ice and local snowfall, and (3) composite ice shelves (Jeffries 2002). Most of the world's ice shelves are fed by glaciers. The largest ice shelves, a big as Texas or France, are located in Antarctica. One example of an ice shelf composed of compacted, thickened sea ice is the Ward Hunt Ice Shelf off the coast of Ellesmere Island in northern Canada. Ward Hunt Ice Shelf: This ice shelf is an example of a shelf made from compressed sea ice. This Canadian RADARSAT image shows the shelf in August 2002, when a crack made its way down the length of the shelf. Image courtesy Alaska Satellite Facility, Geophysical Institute, University of Alaska Fairbanks. Antarctica's major ice shelf areas: These ice shelf areas can easily be seen in NSIDC's Mosaic of Antarctica. Image courtesy Scambos et al. 2007. Antarctica has 15 major ice shelf areas, and 10 of the largest appear in this map. The Wilkins Ice Shelf is an example of a composite ice shelf comprised of both glacier-fed ice and fast ice thickened by snowfall. The others are glacier-fed, but ice formed from direct snowfall accumulation is a significant part of all permanent ice shelves. Two types of events occurring on ice shelves have attracted the attention of scientists. One kind is iceberg calving, a natural event. The other kind is disintegration, a newly recognized phenomenon associated with climate change. Calving of huge, tabular icebergs is unique to Antarctica, and the process can take a decade or longer. Calving results from rifts that reach across the shelf. In the case of Antarctica's Amery Ice Shelf, the calving area resembles a loose tooth. Loose tooth, 2001: These Multi-angle Imaging SpectroRadiometer (MISR) images show the progression of a "loose tooth"—an iceberg calving from the Amery Ice Shelf. Images courtesy NASA Earth Observatory, Clare Averill and David J. Diner, Jet Propulsion Laboratory; and Helen A. Fricker, Scripps Institution of Oceanography. Loose tooth, 1963: In 1963, the CORONA mission captured this image of a gap in on the Amery Ice Shelf. The gap was left by the calving of an earlier loose tooth. Image courtesy Helen A. Fricker, Scripps Institution of Oceanography. On a stable ice shelf, calving is a near-cyclical, repetitive process producing large icebergs every few decades. The icebergs drift generally westward around the continent, and as long as they remain in the cold, near-coastline water, they can survive decades or more. However, they eventually are caught up in north-drifting currents where they melt and break apart. In Greenland, floating ice tongues downstream from large outlet glaciers are more broken up by crevasses. Calving of the ice tongues releases armadas of smaller, steep-sided icebergs that drift south sometimes reaching North Atlantic shipping lanes. Calving of the large glacier, Jacobshavn, on the east coast of Greenland is responsible for the majority of icebergs reaching Atlantic shipping and fishing areas off of Newfoundland and most likely shed the iceberg responsible for the sinking of the Titanic in 1912. 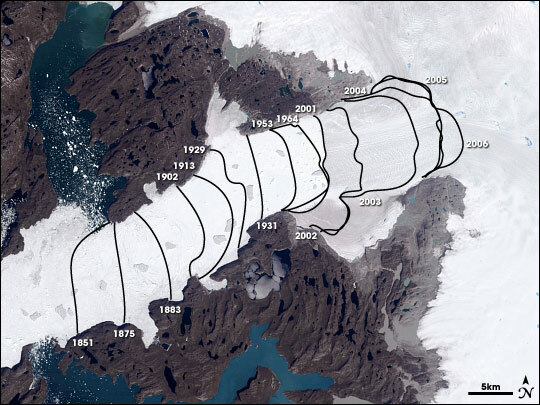 The Petermann Glacier in northwestern Greenland also shed a large ice island in August 2010. These denizens of the ocean are now tracked by the National Ice Center (http://www.natice.noaa.gov) in the United States, along with other organizations. In recent years, calving of the largest ice tongues in Greenland (in particular, Jacobshavn, Helheim, and Kangerdlugssuaq) has accelerated probably due to warmer air and/or ocean temperatures. As the ice tongues have retreated, the reduced backpressure against the glacier has allowed these glaciers to accelerate significantly. By 2006, the Jacobshavn Glacier had retreated back to where its two main tributaries join, leading to two fast-flowing glaciers where there had previously been just one. Jacobshavn Glacier retreat: The rapidly retreating Jakobshavn Glacier in western Greenland drains the central ice sheet. This image shows the glacier in 2001, flowing from upper right to lower left. Terminus locations before 2001 were determined by surveys and more recent contours were derived from Landsat data. The recent stages of retreat have widened the ice front, placing more of the glacier in contact with the ocean. Image courtesy NASA Earth Observatory, Cindy Starr, based on data from Ole Bennike and Anker Weidick (Geological Survey of Denmark and Greenland) and Landsat data. The images below show a tabular iceberg calving from an ice shelf on the Antarctic Peninsula. This iceberg happens to be calving from the remnant piece of the Larsen B ice shelf at the southwestern corner of the embayment. 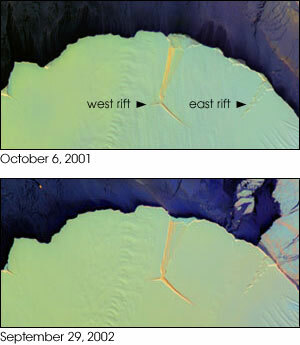 While the Larsen B Ice Shelf underwent disintegration (see below), this was a normal calving event. Iceberg A54 calving: Top: Aerial photo of the A54 iceberg calving from the Scar Inlet Shelf (the remainder of the Larsen Ice Shelf). Photo courtesy Ted Scambos, National Snow and Ice Data Center, University of Colorado, Boulder. Bottom: NASA Moderate Resolution Imaging Spectroradiometer images courtesy NASA Earth Observatory. Large tabular iceberg calvings are natural events that occur under stable climatic conditions, so they are not a good indicator of warming or changing climate. Over the past several decades, however, meteorological records have revealed atmospheric warming on the Antarctic Peninsula, and the northernmost ice shelves on the peninsula have retreated dramatically (Vaughan and Doake 1996). The most pronounced ice shelf retreat has occurred on the Larsen Ice Shelf, located on the eastern side of the Antarctic Peninsula's northern tip. The shelf is divided into four regions from north to south: A, B, C, and D.
In January 1995, after several decades of warming and years of gradual retreat, the Larsen A Ice Shelf underwent a type of retreat that had not been witnessed before. The breakup pattern in the Larsen A, in which roughly 1,500 square kilometers suddenly disintegrated rapidly into small sliver-shaped icebergs, appeared to indicate a new style of ice shelf response to pronounced climate warming. To the south, the Larsen B saw the calving of a 70- by 25-kilometer iceberg. This ordinary calving event received more public attention but the disintegration event was more significant to researchers studying the area. 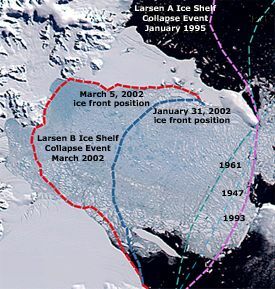 Disintegration of the Larsen B Ice Shelf: The event began on 31 January 2002. Several weeks later, the ice shelf had completely shattered. MODIS image courtesy Ted Scambos and Terry Haran, National Snow and Ice Data Center, University of Colorado, Boulder. Extent of Larsen Ice Shelf retreat: Colored lines mark the ice shelf's extent in 1947, 1961, 1993, and 2002. MODIS image courtesy Ted Scambos, National Snow and Ice Data Center, University of Colorado, Boulder. In 2002, satellites recorded an even larger disintegration than what occurred in 1995 (see Larsen Ice Shelf Breakup Events: Larsen B Ice Shelf Collapses in Antarctica). Between 31 January and 5 March 2002, approximately 3,250 square kilometers of the Larsen B shattered, releasing 720 billion tons of ice into the Weddell Sea. It was the largest single disintegration event in 30 years of ice shelf monitoring. Preliminary studies of sediment cores suggest that it may have been this ice shelf's first collapse in 12,000 years. Wilkins Ice Shelf: The Wilkins Ice Shelf extends from the Antarctic mainland to Charcot and Latady Islands. Black lines indicate the approximate ice shelf front at the beginning of 2008. Blue lines indicate new shelf fronts after retreat events in 2008. Image courtesy Antarctic Glaciological Data Center Images of Antarctic Ice Shelves. Also on the Antarctic Peninsula, southwest of the Larsen Ice Shelf, is the Wilkins Ice Shelf. In 1998, the northern part of that ice shelf broke up, although the ice fragments remained in place for the next decade. In 2008, three significant breakups occurred. 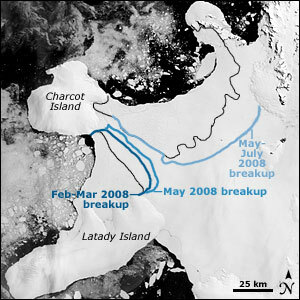 The first breakup began in late February 2008, on the western part of the shelf, between Charcot and Latady Islands. This breakup style was very similar to the event previously seen on the Larsen A and B. The event occurred during the Southern Hemisphere summer, after an extensive melt season, although no melt ponds were observed. Beginning in May 2008, the western part of the shelf underwent further retreat, again in the disintegration style, despite cold autumn surface conditions. Later in June and July, a substantial portion of the northern part of the shelf also broke up. The breakups occurring between May and July 2008 were especially significant because they happened during the Southern Hemisphere's cold season. Wilkins Ice Shelf Disintegration, summer 2008: The summertime breakup of the western Wilkins Ice Shelf occurred in a matter of days. NASA Moderate Resolution Imaging Spectroradiometer images courtesy NASA Earth Observatory. 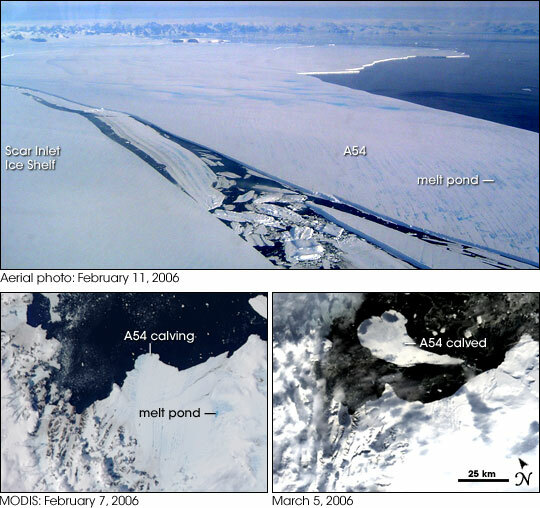 Wilkins Ice Shelf Disintegration, 2009: These images show the breakup of the remaining ice bridge extending to Charcot Island. The image on the left shows the intact bridge, on 31 March. The image on the right shows the same bridge shattered, on 6 April. High-resolution images available from the NASA Earth Observatory. The Wilkins Ice Shelf had broken up in 1998, but the ice blocks remained frozen in place for a decade, held together partly by the accumulation of snowfall. But in 2008, radar images showed a darkening in the areas between ice blocks, followed by the gradual disappearance of these snowy, icy areas. 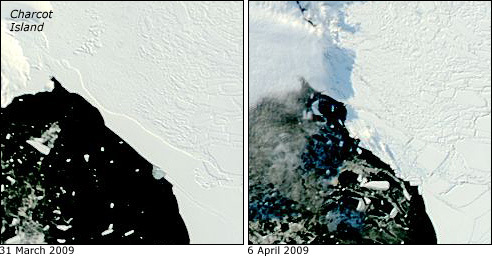 The 2008 imagery indicated thinning between ice blocks, despite winter conditions, and suggested melting from beneath, due to warm water under the ice shelf. As a result of ice loss to the north, rifts south of the 1998 breakup area began to widen, leading to a series of rapid moderate to large iceberg calvings. Through late winter of 2008, the remaining two-thirds of the shelf stabilized between Latady and Alexander Islands, although fresh cracks appeared on the shelf in late November 2008. In April 2009, the ice bridge connecting the remnant shelf to ice fragments around Charcot Island gave way. Although smaller than Antarctic ice shelves, ice shelves in the Northern Hemisphere have also attracted the attention of glaciologists. In the early 20th century, Arctic explorer Robert Peary observed a massive "glacial fringe" along the northern coast of Canada's Ellesmere Island. At that time, the glacial fringe was likely a continuous ice shelf covering some 9,000 square kilometers. By the 1950s, much of the ice had disintegrated, and by the turn of the 21st century, the once-continuous ice shelf had been reduced to several smaller ice shelves. In 2002, one of those shelves, the Ward Hunt, fractured, releasing several large ice fragments totaling nearly 3 gigatons of ice into the Arctic Ocean. In 2005, another shelf, the Ayles, broke free. In the Northern Hemisphere summer of 2008, a new wave of ice shelf disintegrations began along the Ellesmere Coast, stripping more ice from the Ward Hunt and the Serson, and completely removing the Markham Ice Shelf. The Ward Hunt experienced further fracturing in August 2010, when a Bermuda-sized ice island broke free. 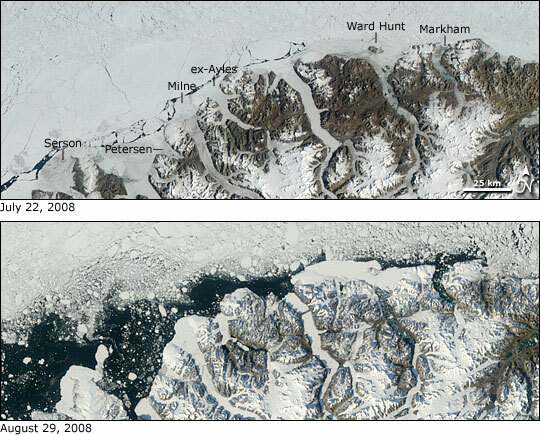 Ice Shelf Retreat along the Ellesmere Coast: Between 22 July (top) and 29 August (bottom) 2008, the five ice shelves remaining in the Canadian Arctic experienced major losses. By late August, Ellesmere ice shelves had lost a total of 214 square kilometers (83 square miles). Images courtesy NASA Earth Observatory. Building on earlier research about Antarctic ice shelf disintegration (Weertman 1973 and Hughes 1983), Ted Scambos of NSIDC, Christina Hulbe of Portland State University, and Mark Fahnestock of the University of New Hampshire developed a theory to explain the disintegration of the Larsen and some other ice shelves. Sufficiently warm summer temperatures form a layer of surface meltwater. In the case of the Larsen Ice Shelf, the meltwater collects in melt ponds, and is available to fill small surface cracks. Depending on the amount of water and the depth of a crack, the water can deepen the crack and eventually wedge through the ice shelf (Scambos et al. 2003). More recent research examining breakups of the Larsen A, Larsen B, and Wilkins Ice Shelves found that regional sea ice retreat plays a previously underappreciated role in ice shelf disintegration (Massom et al. 2018). Sea ice normally buffers ice shelves from ocean swells. When sea ice retreats, in the wake of warmer air temperatures, offshore storm events can send long-period waves toward the front of an ice shelf. If the ice shelf is already flooded and experiencing fracturing along its outer margin, the ocean swells can further weaken the shelf, leading to breakup events. A critical feature of a glacier-ice shelf system is the "grounding line," the point where the flowing ice begins to float. If the ice shelf calves and retreats to the grounding line, the glacier is called a tidewater glacier. Tidewater glaciers have no floating section but the glacier front extends well below the water surface. With further retreat, the tidewater ice front can become taller, protruding higher above the water line. The ocean water exerts less buoyant pressure on the ice, and the loss of the shelf ice removes all backstress from ice rises, or from marginal shear areas. As a result, the flow of the glacier meets very little resistance. In the 18 months following the Larsen B Ice Shelf disintegration in 2002, glaciers feeding that ice shelf accelerated between three and eight times their original speed (Scambos et al. 2004 and Rignot et al. 2004). Retreat of the Larsen A Ice Shelf led to a two- to three-fold increase in flow of its largest glacier (Rack and Rott 2004). Studies published a decade or more after the Larsen B breakup event continued to report accelerated flow in glaciers on the Antarctic Peninsula (Berthier et al. 2012, Hulbe et al. 2013, Rott et al. 2014, Scambos et al. 2014, Khazendar et al. 2015). Similar glacier-accelerating mechanisms are at work in the Jakobshavn Isbrae, Kangerdlugssuaq, and Helheim Glaciers in Greenland (Joughin et al. 2004). Basal melting near the grounding line on a shelf can also accelerate the glacier, e.g., Pine Island Bay (Payne et al. 2004). Warmer ocean temperatures also drive ice shelf breakup. Several studies have cited evidence for warm ocean waters thinning ice shelves from beneath. This "basal melting" appears to be associated with increased rifting and calving of large iceberg chunks (much larger than in the disintegration case) (Shepherd et al. 2003 and Kazandhar 2007, Glasser and Scambos 2008, Vieli et al. 2007). Ocean water just a degree or two above freezing carries huge potential for melting ice. Rignot and Jacobs (2002) estimated that for each 0.1°C above freezing point, ocean water circulating under the shelf could melt 10 meters of ice per year. While ocean water in the Antarctic and Arctic is warming slowly, a more important effect appears to be more frequent circulation of warm waters in ice shelf areas due to wind and current changes (Stammerjohn et al. 2008 and Rignot et al. 2008). A 2016 study on Antarctica's past and future sea-level rise examined the interaction between warm ocean water, ice shelves, and the ice sheets they buttress. The study examined the processes of marine ice sheet instability and marine ice cliff instability. Both processes can lead to ice shelf retreat and increased ice flow into the ocean. Where an Antarctic ice shelf retreats to a grounding line deeper than roughly 800 meters, the ice cliff may protrude above the water line more than 90 meters, and such a tall cliff face would be prone to rapid collapse (DeConto and Pollard 2016, Parizek et al. in press). Instability processes: These diagrams depict marine ice sheet instability (left) and marine ice cliff instability (right). (a) shows a stable system where the ice shelf buttresses the ice sheet behind it, but warm ocean water melts the ice. Melt shortens the ice shelf (b), and reaches all the way to the grounding line (c). (d) shows ice shelf crevassing and calving. Calving continues (e), and retreats until the ice cliff rises far enough above the water surface to become unstable (f). Image from DeConto and Pollard 2016. Other mechanisms may be operating in areas with warm water circulation that lead to a more gradual destabilization of the ice shelves. Warm water circulating under the shelf and melting the base of the ice shelf produces a return flow that moves back towards the ocean on the underside of the ice. This water, which still has some heat in it, can channelize the underside of the ice, creating inverted canyons in the ice shelf that can focus shear strain and weaken it (Le Brocq et al. 2013, Alley et al. 2016, Gourmelen et al. 2017). The Larsen B Ice Shelf on the Antarctic Peninsula was a glacier-fed shelf, and after its disintegration, the glaciers feeding it accelerated. If all of those glaciers were to flow into the ocean, they would raise ocean level by only a few millimeters. Greenland's glaciers and those feeding the Ross Ice Shelf, however, would have a more significant effect. The Ross Ice Shelf is the main outlet for several major glaciers from the West Antarctic Ice Sheet. This single ice sheet contains enough above-sea-level ice to raise global sea level by 5 meters. At present, the Ross Ice Shelf's mean annual temperature is well below freezing. Although summer temperatures in the warmest part of this shelf are currently just a few degrees too cool for the formation of melt ponds, there is no evidence of a strong warming trend on the Ross Ice Shelf at this time. The Thwaites and Pine Island Glaciers flow into Pine Island Bay, and drain the West Antarctic Ice Sheet. These glaciers would only need to retreat a short distance before leading to accelerated retreat. Such a process may have happened before (Wise et al. 2017). Marine ice cliff instability driving runaway retreat: This conceptual illustration depicts a stable ice shelf held in place by a grounding zone wedge (GZW) (a), but retreat past this wedge leads to rapid disintegration and retreat (b). The system can eventually reach an equilibrium (c) before retreat continues (d). Note the vertical scale exaggeration. Image from Wise et al. 2017. Since the late 1980s, a number of Antarctic ice shelves have retreated. This table gives an overview of retreat events as of early 2008. Note that numbers are approximate and some observation periods overlap. 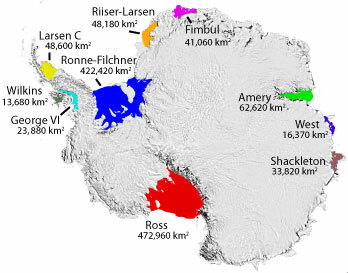 Recorded Changes in Antarctic Peninsula Ice Shelf Areas: Adapted from Alison J. Cook, British Antarctic Survey, Natural Environment Research Council, 2008. Quick Facts on Ice Shelves: Find basic information on ice shelves.